I first started hooping after being diagnosed with MS in 2012. Part of my recovery from my first attack was hooping, doing TRX and purchasing a Vitamix. Additionally, I stopped eating processed foods and embraced whole foods. This was new for me. I realize now I was a meat, potatoes, processed food and sugar junkie. Smoothies were great because I could shove as much green leafy stuff and antioxidant berries into them as I could. All my exercise revolved around core strengthening activities and bringing balance to my body, so I could stop walking with a cane. I did that! 19 months later, my family and I moved to FL where I found a Hoola-Fit class on the beach. It was there that I started really enjoying hooping and learning new things I could do with the hoop. Hoola-fit classes became a staple for my exercise and it is there that I formed new friendships. Tack on another year and in Aug of 2015 I became a certified Hoola-Fit instructor. 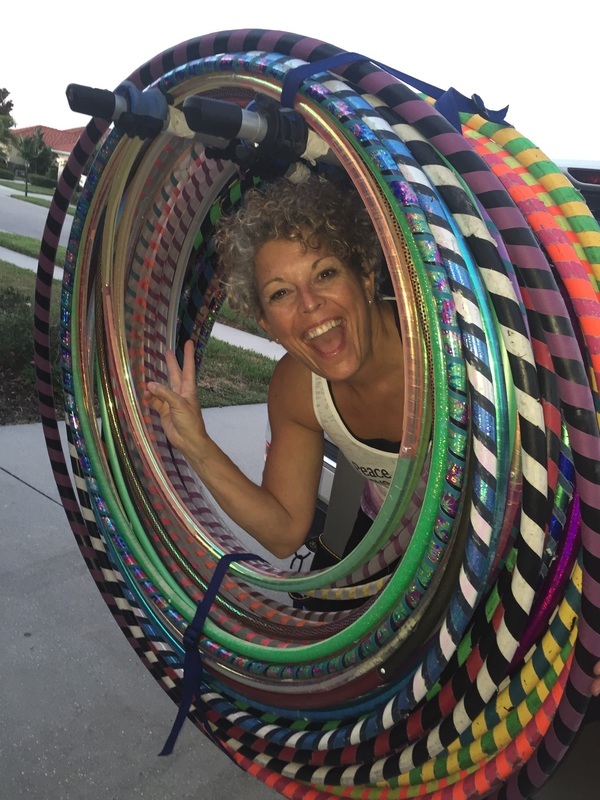 Shortly after that, with my mentor and friend Heather: owner of Peace, Love and Hoopiness, we started a class, near and dear to my heart, called, Restorative Hooping. The intention of the class for me was to reach people, maybe with MS like me, who needed movement. This class is still a work in progress. Born out of that class and my trip to the Terry Wahls' seminar in Aug of 2016 was my YouTube Channel called, Restorative Hooping with Crazy Amy. This channel offers hooping information, from slowing something down for my hoopers to practice at home, to basic hoop information for new hoopers. Stories from the Hoop Circle, are also found on that same YouTube channel. I find great joy in interviewing everyday people who have had hooping and/or food profoundly change their life in some way. The interviews are a great way to find out more about hooping for fitness and why it is so much fun and so darn good for you! What is most exciting for me is to have everyday people experience such success from just hooping and having fun. Some of those stories are about health, wellness and food and maybe not just about hooping. And finally, after teaching Hoola-Fit for 2 years with Peace, Love and Hoopiness, I am taking my business independent. Thank you, Heather, for all your guidance, hoop moves and encouragement. To my husband, Rich thank you for all your love and support since I was diagnosed with MS. Thank you most of all for buying me my first hoop and for encouraging me to journey onward. ​Welcome to Amy's Hoop Circle - Online.